Fabrizio De André, the revered Italian singer/songwriter, created a deep and enduring body of work over the course of his career from the 1960s through the 1990s. With these translations I have tried to render his words into an English that reads naturally without straying too far from the Italian. The translations decipher De André's lyrics without trying to preserve rhyme schemes or to make the resulting English lyric work with the melody of the song. "La nova gelosia" is a Neapolitan song from the 18th century by an unknown author. When De André heard the song as done by Roberto Murolo, he became enthralled with it and wanted to include it on this album. The tradition of Neapolitan songs has its roots in the 13th century, and came into full bloom in the period from 1830-1950, when an annual song competition would honor the best song each year. you hide from me my beautiful Nennarella. Let me see her; if not, I will die. It took six years after the tremendous success of Creuza de mä for De André to release his next studio album, Le nuvole (The Clouds). In the meantime, he and Mauro Pagani explored several avenues of musical collaboration which did not come to fruition. 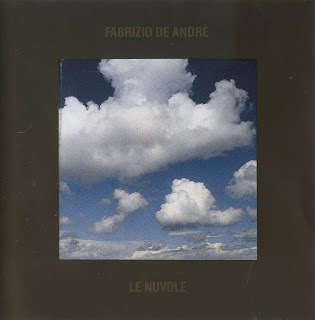 De André had this to say about Le nuvole: "I realized that people are just pissed off, and since Le nuvole is a symbol of this dissatisfaction, the transference, the intermediary for this general discontent, I would say that the album was welcomed almost as a banner, like an emblem of the anger in the face of a nation that is going to the dogs, and certainly not through any fault of the citizens." Additionally, Mauro Pagani said the album was a fantastic description of Italy in the 1980s, with parallels to Europe in the early 1800s: "Italy in the early 1980s was like Europe in 1815: the Congress of Vienna, the fall of the Napoleonic empire, the sharing of the goods among the winning powers, social classes built on wealth instead of aristocracy, a society of fake Christianity . . ." The title of and inspiration for the album came from the comedy of the same name by Aristophanes, whom De André greatly admired. Studio italiano dal febbraio, 2008. Ho cominciato prima di viaggiare in italia con la famiglia (Verona, luglio 2008). Grazie a Mirella, Francesca e Bianca che mi hanno aiutato molto.